Graduates of Samford University’s Cumberland School of Law were encouraged to look beyond themselves, to focus on serving others and to be persistent in pursuing their goals during the law school’s commencement ceremony May 13. 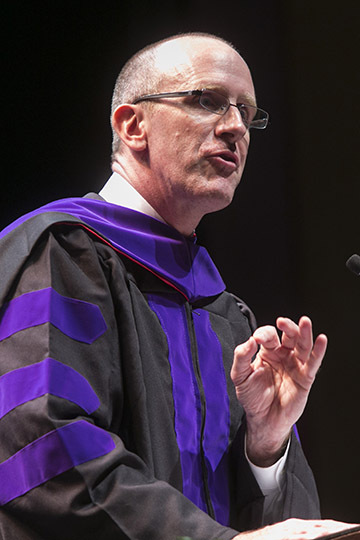 Terry McCarthy, adjunct professor and partner at Lightfoot, Franklin & White LLC was chosen by the Class of 2016 to deliver its commencement address. The first story was about Afleet Alex, a race horse that won the Preakness Stakes, Belmont Stakes and very nearly won the Kentucky Derby. More importantly, though, Afleet Alex’s owners helped to raise millions of dollars for pediatric cancer research by using Afleet Alex’s spotlight to vault one little girl’s cause to the national stage. Soon thereafter, Alex’s lemonade stands were assembled at racetracks across the country, and her cause was picked up by national media outlets. Alex’s efforts eventually became a foundation that has raised more than $120 million for childhood cancer research, “all because of the vision of one 4-year-old girl, the courage of her parents and the determination of a horse who shared her name,” exclaimed McCarthy. Prior to his death, White established the Jere F. White Jr. Fellowship Program at Cumberland School of Law, which is awarded to one entering student per year. The first recipient of the prestigious fellowship, Caroline Collins Muse, is a 2016 graduate of the law school and was in the audience. Also in the audience was 2016 graduate J. D. Marsh, whose father, David Marsh, was on the opposite side of White in many big cases. The third story was the story of the Class of 2016. McCarthy began by stating, “Lawyers need to laugh more.” He then recounted several humorous tidbits of personal information his students had written down on notecards during their first day of class, including “I once got run over by a golf cart,” and “My great (eight times removed) uncle is George Washington.” He then teased the class valedictorian, J. D. Marsh, for misspelling a word on his notecard. “All teasing aside,” McCarthy continued, “this graduating class includes brilliant litigators, gifted athletes, individuals committed to serving the community, and a group that has survived ‘snowmageddon’ and celebrated ‘Rascal.’ Most importantly, though, you have formed a bond that will last for years to come. Also at commencement, the law school presented its annual Daniel Austin Brewer Professionalism Award to Stewart Alvis of Birmingham, Alabama. Alvis was an active member of the Cumberland School of Law National Trial Team, the Student Bar Association and the Cumberland Law Review. During his three years at the law school, Alvis served in various leadership positions including chief judge of the Cumberland Trial Advocacy Board, acquisitions editor and junior editor of the Cumberland Law Review, and Student Bar Association class representative and vice president. He is the eighth member of his family to graduate from Cumberland School of Law.